The thin Nokia 700 is certainly a tiny smartphone, but is it packing much hardware in that skinny frame? 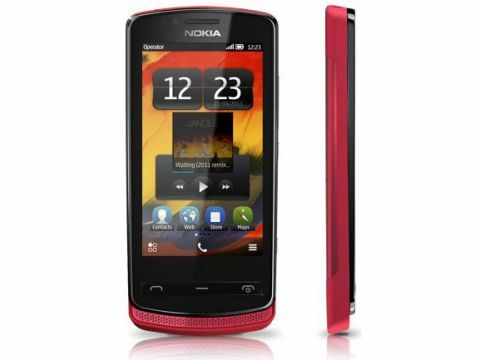 The Nokia 700, touted as the world's smallest smartphone, is dropping as part of a trio of Nokia handsets (the 600, 700 and 701) running the new Symbian Belle interface. And it is indeed small. It's slim. It's quite sleek too, and many other 'S' adjectives as well. The thin frame holds a 3.2-inch AMOLED ClearBlack touchscreen, 5MP and VGA cameras, an external speaker hugging the bottom curve, and all this in only a 92g, 9.7mm-thick phone. It's pretty swish. The smooth battery cover has a brushed steel finish that feels smooth to the touch, encasing the 5MP camera with LED flash and - happily - a tiny clip, meaning no scrabbling around to get the cover off. There's an almost miniscule camera soft key on the right side, plus a lock button and slightly longer volume rocker. All of these are fingernail thin and a little oddly spaced. At the top sits the micro USB port, 3.5mm headphone jack and charge port. And on the front are three soft keys: call, end call and menu. The Belle iteration of the Symbian operating system looks to have taken some pretty heavy inspiration from Android, with its widget-laden six home screens. Although there is the occasional mini-freeze, the user interface - running off a 1GHz processor - is generally slick and much more lag-free than its Nokia smartphone predecessors such as the E7; a great improvement from Symbian, which is usually the Achilles' heel of Nokia handsets. Overall, the Nokia 700 looks like a slim, smarter version of the businessman's Nokia, but this may not be the target audience, given the launch of an exclusive Elle app to boost the Nokia 700's launch. Perhaps then, this points the target at business people who want a decent smartphone that's slim and discreet, since the Nokia 700 certainly is that. It's small but sturdy, and the sleek design will appeal to all who want smartphone capabilities without being ostentatious.